When visiting Thailand there are many places that one simply must see. One such must see attraction lies a few kilometres South West of Chiang Rai that attracts large numbers of domestic and overseas tourists every day. Wat Rong Khun, foreigners will know it better as “The White Temple”, stands majestically in the sun looking almost mythical. 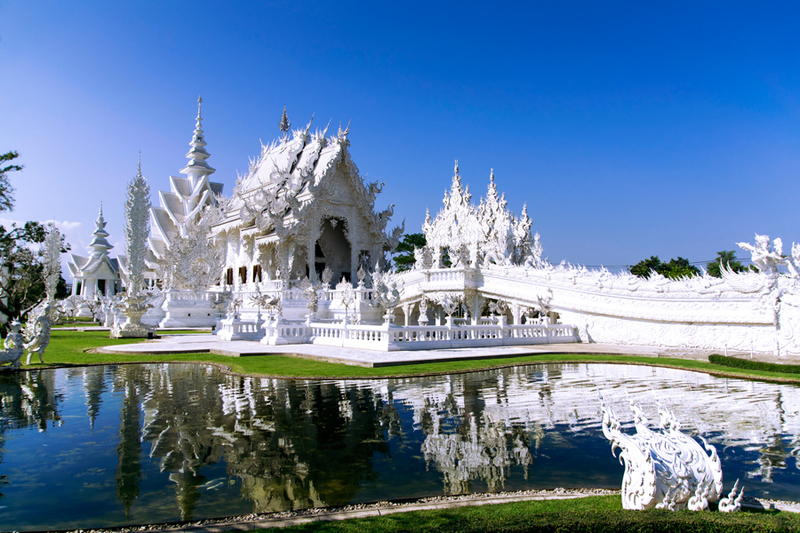 Made from pure white plaster interspersed with pieces of glass the White Temple is a surreal place to visit and many tourists when visiting are dumbstruck by the absolute beauty of the place. It may come as a surprise that the temple that stands just outside Chiang Rai is not the original temple. The previous Wat Rong Khun reached such an appalling state of disrepair that not only was it an eyesore but it was also not attracting tourists. On top of this, many people thought it was insulting to the Lord Buddha and hence a local artist, Chalermchai Kosipipat decided to totally rebuild the temple. Opening to the public in 1997, Wat Rong Khun is built in the cleanest white possible to signify the purity of the Buddha, adding glass into the construction to symbolise the Wisdom of the Buddha the building is a work of art as well as a temple. Chalermchai Kosipipat, built Wat Rong Khun using his own money and to honour the Buddha. The temple although seemingly complete is not a finished temple and is an on-going work of art that is adored by locals and tourists alike. 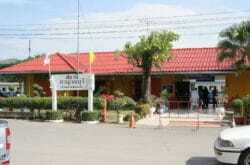 In 2014, the area around Chiang Rai suffered a very large earthquake. Considerable damage occurred in the town and the temple itself was badly damaged. Chalermchai Kositpipat was not put off by this and once again resorted to restoring the temple to it full glory. The earthquake damage also allowed the project to be fully reviewed was thus extended and at present, Wat Rong Khun has nine buildings. Tourists may think that the temple is just one building but they would be wrong, the White temple contains many structures that include an Ubosot or prayer room, a hall or museum that contains and preserves Buddhist relics, a meditation hall and the living quarters for the Buddhist monks that reside at Wat Rong Khun. One of the more popular buildings that forms part of this outstanding tourist attraction is the art gallery. Tourists need to be aware that when visiting Wat Rong Khun they are visiting a place of religious importance. For this reason, dress code needs to be respectful and shoes must be removed upon entering. One should also be aware that there are restrictions on taking photographs and photos are strictly forbidden in the main building. The White Temple is a bucket list attraction for many tourists to Thailand and for this reason, those visiting should be made aware that the temple can get very busy, especially during festivals or special days. Wat Rong Khun opens at 8am – 5pm Monday to Friday and 8am – 5.30pm Saturday and Sunday; it is advisable to arrive early if one wants to soak up the peace and tranquillity of grounds that can become very busy. 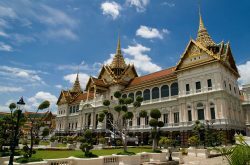 Thai nationals are able to enter the temple for free, however foreigners are required to pay 50 baht in order to keep the temple’s future viable. When you pay for your ticket you will also receive a booklet. Works of art, some produced by Chalermchai Kositpipat himself are available for purchase at the temple along with many other souvenirs. However, it is not so much the souvenirs you purchase at this amazing place that you will take home but the sense of wellbeing and inner peace having visited. The supernatural feeling of being in or just close to this brilliantly white temple cannot quite be described and this alone makes the place one worth visiting and enjoying.